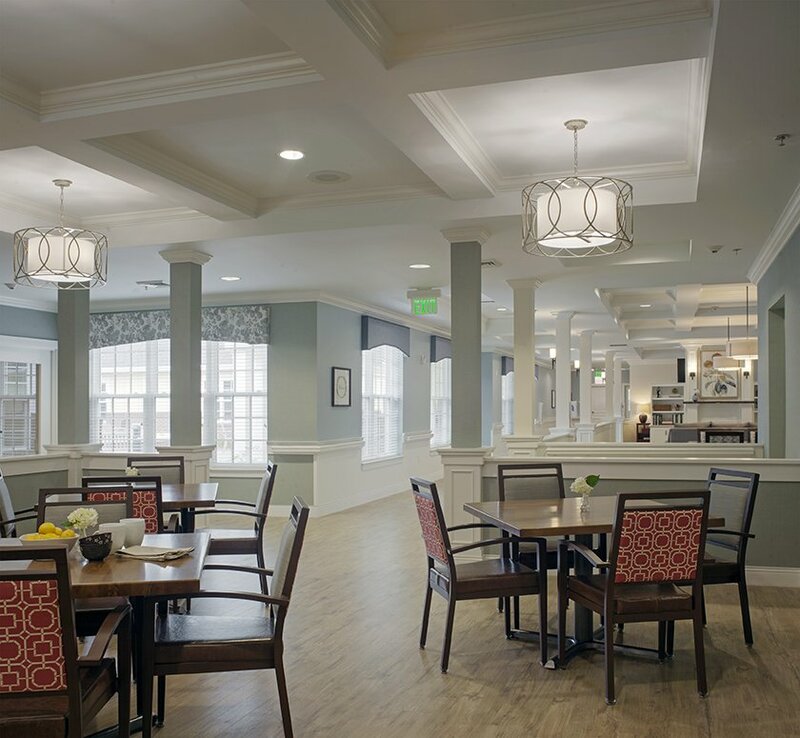 With the opening of the Babcock Health Care Center, skilled-nursing and memory care residents of Salemtowne Retirement Community have a beautifully designed new home — and the local community has gained badly needed short-term rehabilitation beds. CJMW was charged by Salemtowne with designing Babcock as a homelike environment, unlike the old models that were more institutional in design. 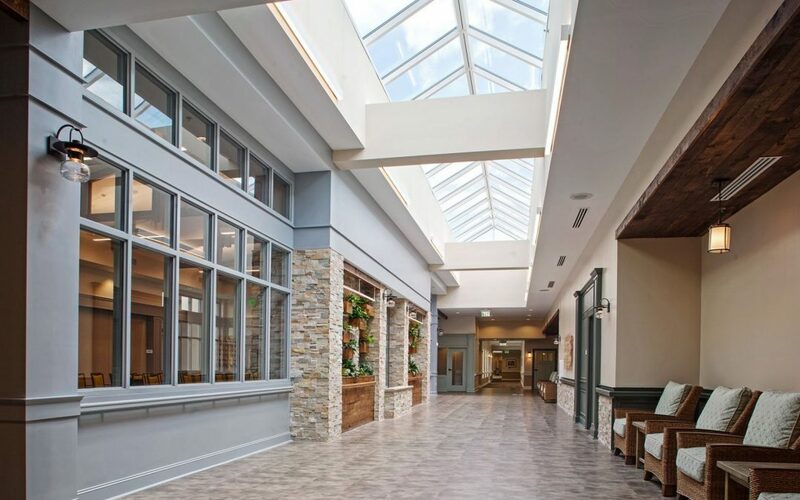 The resulting 127,000-square-foot building is a great leap forward in the quality of life Salemtowne offers its skilled-nursing and memory residents. CJMW provided both architectural and interior design services. The 120 residents will live in six “households,” each with 20 private rooms and their accompanying private bathrooms with accessible showers. Also in each household is an accessible kitchen, dining room, living room, activity room and sun room. 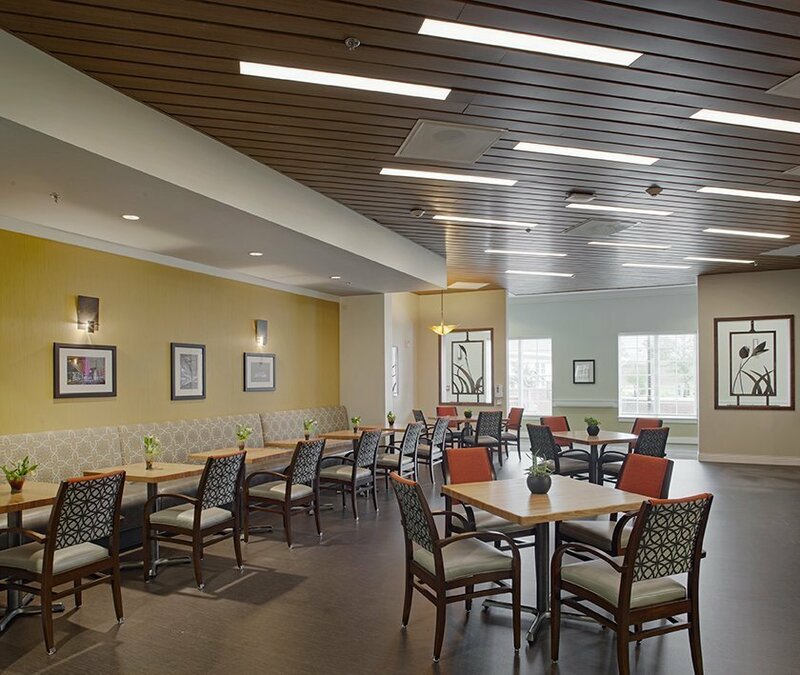 Residents can receive fresh, cooked-to-order food while interacting with the cook and staff preparing it. A refrigerator and sideboard holds beverages and snacks. Research suggests that seniors benefit tremendously – socially, psychologically and physically – from greater access to the outdoors. Resident rooms as well as hallways are designed to let in a great deal of natural light, and every household has direct access to a nicely landscaped outdoor courtyard. An inside corridor of the building is bathed in light from tall, sky-lighted ceilings and accented by water features and plant walls. Three of Babcock’s households will accommodate 60 skilled-nursing residents. An additional 20 will live in a fourth household designed especially for memory care. 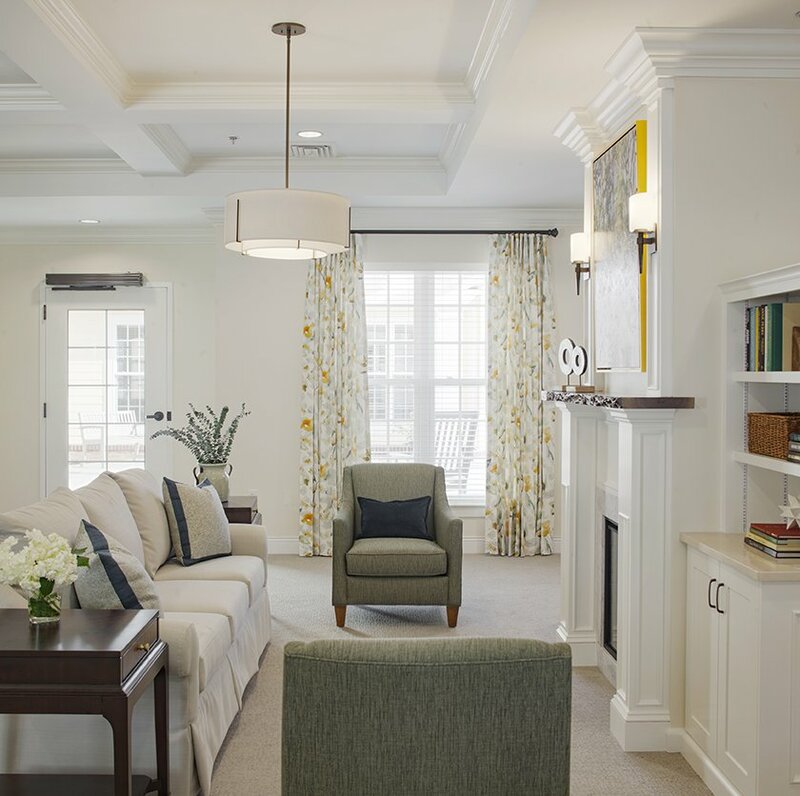 While hallways have similar layouts, each has distinctive light fixtures and walls of a different pastel color to help residents and visitors with way-finding. Common areas include fireplaces with beautifully crafted mantels made from reclaimed walnut trees that once stood on the property. Babcock also includes a 40-bed short-term rehabilitation/skilled nursing area. This area was included after local hospitals told Salemtowne that they were sending some patients recovering from serious surgeries, such as hip replacements, to facilities outside Winston-Salem because of the lack of short-term rehab beds. 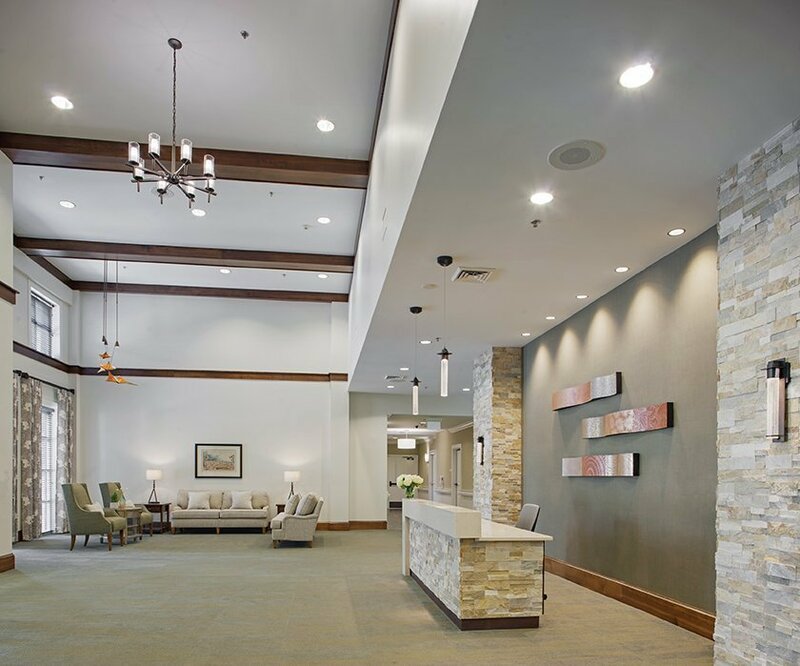 CJMW began working with Salemtowne in 2013, developing a 20-year master plan that responds to the growing and changing marketplace in senior living. 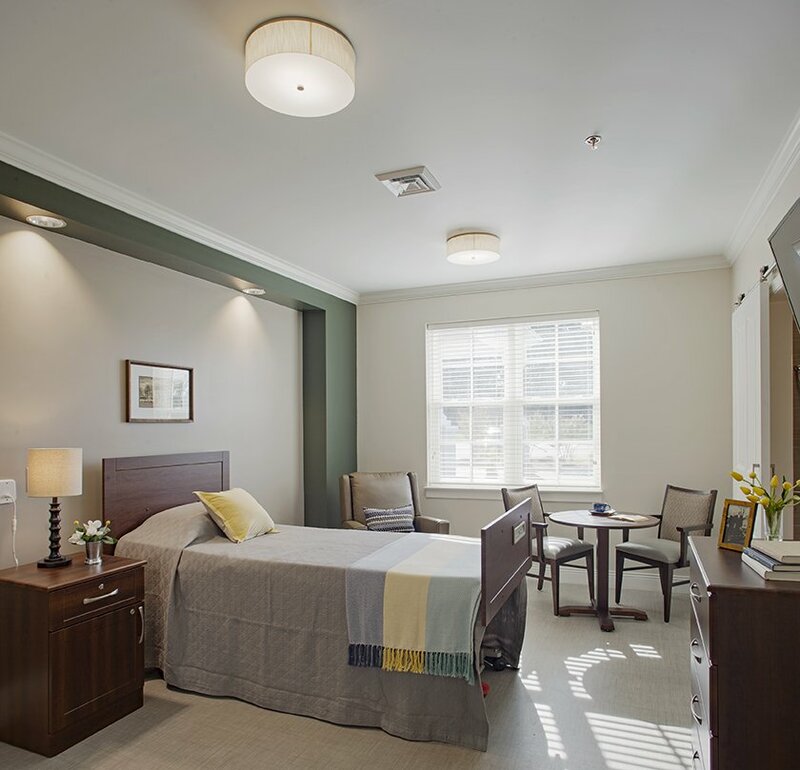 Now that residents have moved in to Babcock – the first phase of the plan – the Phillips Healthcare Center, their former home, will undergo extensive renovations and reopen as assisted living apartments. A third phase of the plan will be the construction of villas for independent living residents. CJMW is currently designing these second- and third-phase facilities. “Salemtowne seeks to be on the leading edge in the quality of care and amenities it offers its residents, and CJMW is honored to be part of this transformation,” said Alan Moore, AIA, the lead architect on the project.